Earlier this week our fifth graders and their teachers visited the National Museum of the American Indian here in downtown New York, where the boys participated in a self-guided tour of the Infinity of Nations exhibit. Arranged in a series of display cases--each representing a Native American culture region--the exhibit presents a diverse array of artifacts including, musical instruments, weapons, ceremonial objects, and clothing. In line with our school's focus on Making Thinking Visible (see an earlier post on this topic) the boys used "the Explanation Game," a thinking routine in which they recorded observations and drew inferences about the different cultures presented in the exhibit. 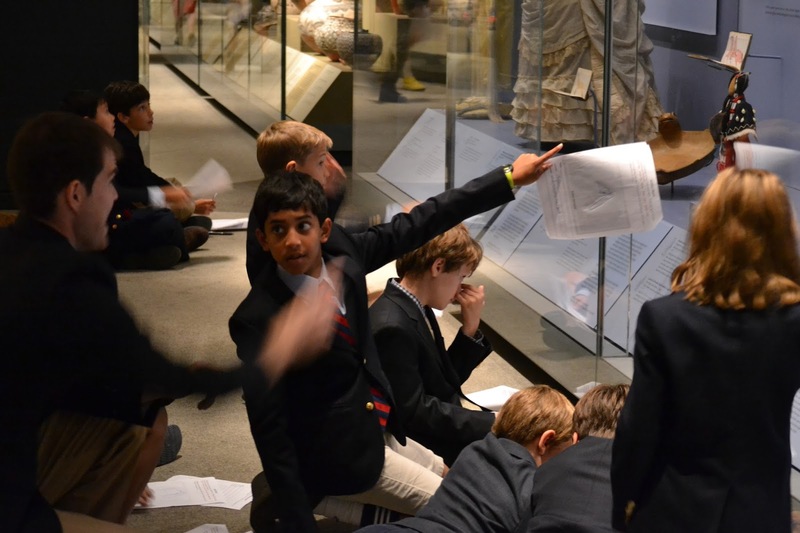 This routine will help lead the boys toward understanding the many ways that Native American tribes adapted and modified their environments. 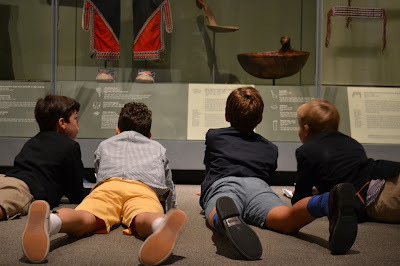 The boys' visit to the museum marks the beginning of a new unit in fifth grade history that centers on the effects of the encounters between Native Americans, European explorers, and colonial settlers. This unit requires the boys to critically analyze the information they encounter on these topics, to ask important questions, and draw nuanced, insightful conclusions. 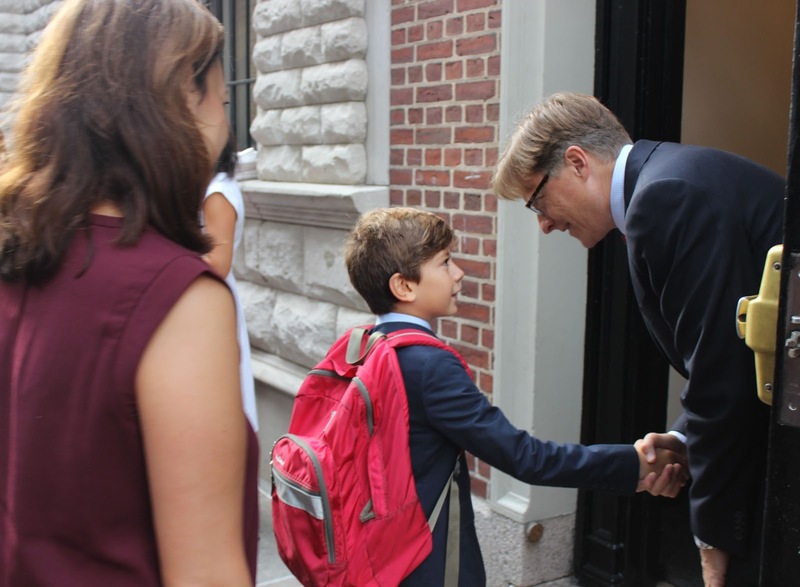 As their teacher Mr. Hubbard notes, "This is just the first stop in what promises to be an exciting term!" 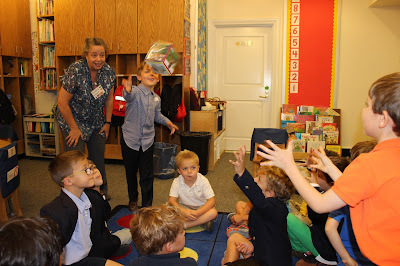 Walk by a Spanish immersion class on our first floor, and you are in for a treat: boys may be singing "Take Me Out to the Ballgame" in Spanish, or playing a variety of games, including "Memory." 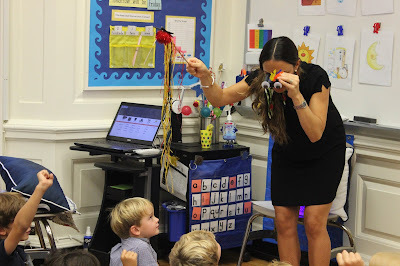 Teachers are often dressed up in fun colorful costumes, using props to drive home a topic, using playful visual and musical activities to engage our young learners in ways that help them to retain content. We rolled out our Spanish immersion program at Saint David's several years ago. Our current sixth graders, who were the first class to study Spanish beginning in Pre-K, now have seven years under their belts! Because our program is aligned with topics the boys are studying in other classes, the concepts introduced in Spanish are familiar to the boys and extend their understanding of multiple disciplines. Research shows that elementary school study of a second language, in addition to laying a foundation for fluency, results in cognitive benefits, academic achievement, increased self-esteem, creativity, and positive attitudes toward diversity. Our boys are well on their way! 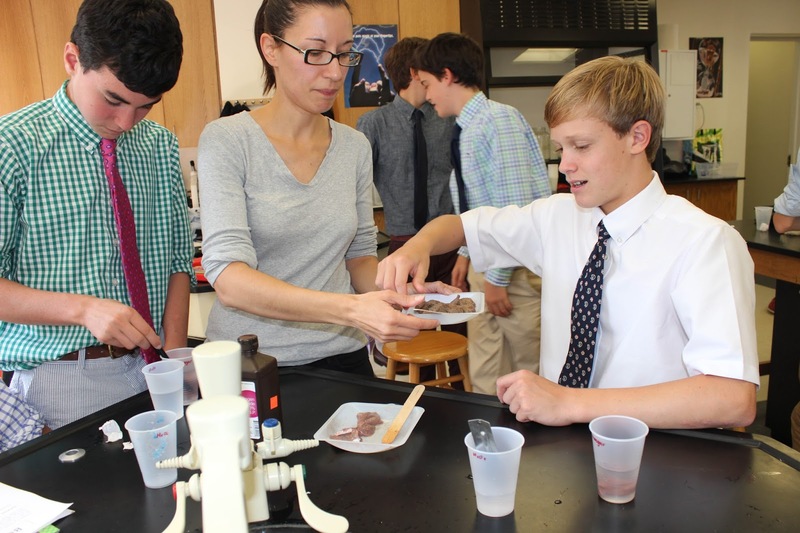 The following article by Upper School Science Teacher Anna Liebowitz appears in the summer 2015 issue of Saint David's Magazine. When I was a sophomore at Princeton, I took a course required for my major, the Molecular Biology Core Lab, an intense, semester-long lab course in which we learned all the major tools and tricks of Mol Bio, as we called it. We learned to isolate, sequence, and copy DNA, and to manipulate DNA in living bacteria. By the end of the course, we were all well prepared to join academic research labs to investigate and complete our senior theses. 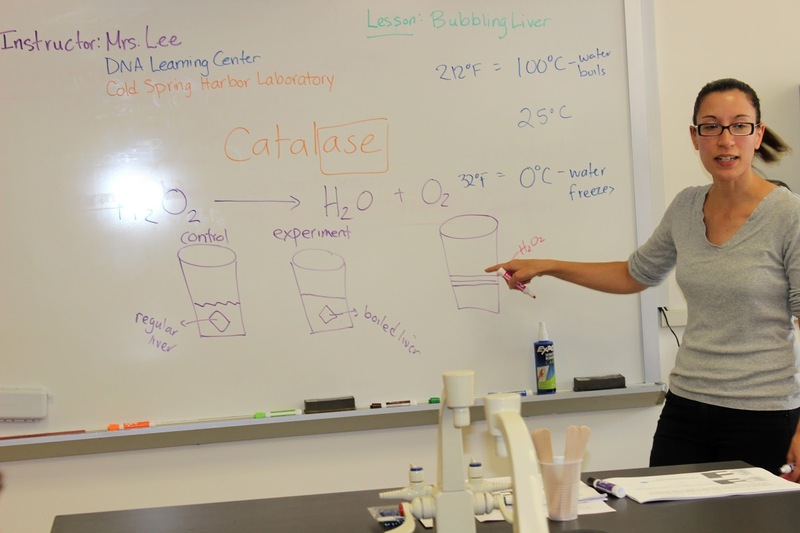 This spring, we transformed Eighth Grade science class into a course remarkably similar to Core Lab. 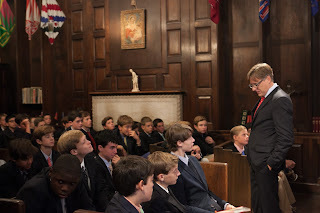 In February, we inaugurated the Eighth Grade partnership with the Cold Spring Harbor DNA Learning Center. Educators from the Learning Center led students through a series of ever-more complex labs, culminating in a multi-week DNA Barcoding research project, in which students chose topics of investigation, gathered samples outside of school, and isolated and processed DNA in order to determine the species that their sample belonged to. CSH faculty visited the Eighth Grade classes at Saint David’s numerous times throughout the spring; in addition, the boys traveled to the Learning Center’s teaching laboratory on Long Island for a day of labs and investigations. Early on, students studied the structure of DNA by building model molecules, matching complementary nucleotides, and adding bases to a sugar-phosphate backbone. They extracted DNA from bacteria and examined it with their naked eyes. Soon, students began manipulating DNA in living organisms by genetically modifying bacteria in order to make them glow green; when they visited the CSH lab, they learned about and tested ways that DNA evidence is used in forensics. Throughout these increasingly complex labs, students honed their use of some key molecular biology tools and techniques — tools that I first encountered in college, and then used every day during my student internships in genetics labs. Saint David's boys in our Philharmonic Ensemble already are rehearsing for one of the four performances they will give this year. 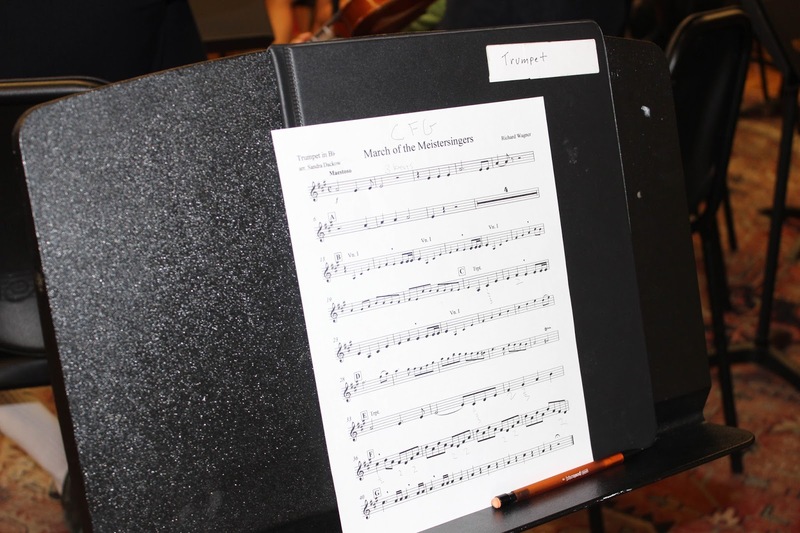 Before school began this morning, they were in the music suite working on Wagner's March of the Meistersingers (see video clip). Under the direction of conductor Phil Hough, this dedicated group of boys in Grades Three through Eight rehearses twice a week before school throughout the school-year. In addition, members commit to significant practice time at home. 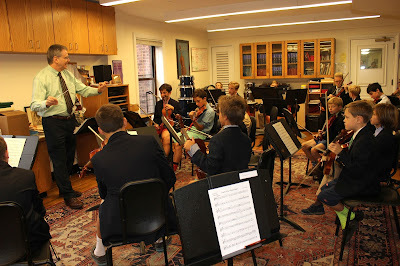 The Ensemble, along with the school's First Orchestra, which is open to our younger boys, the Chamber Singers, Recorder Consort, Percussion Ensemble, and the many music classes our boys take during the year, provide our boys with an amazing array of opportunities to explore and engage with music. Music has always played a strong role at Saint David's, a manifestation of our mission's commitment to the aesthetic and the classical ideal of balance. The formation of thoughts and ideas is often an invisible process, yet it is the basis for learning. Remembering, reflecting, reasoning, analyzing, and synthesizing are complex internal processes that shape the way a person makes sense of the world. Providing opportunities for a student to share his thinking gives the educator a window into his mind and allows the educator to tailor instruction to meet the student’s needs. As boys are asked to explain their thinking, they develop language for talking about thinking and gain a sense of ownership in the process. Explicitly teaching students thinking moves they can use to understand a wide range of topics helps them become empowered as learners. Making boys’ thinking visible promotes student engagement, understanding, and independence. At Saint David’s, we aim to immerse students in rich learning experiences that engage boys in thinking and lead to deep understanding. The Teaching for Understanding Framework is a model we use to conceptualize and design units of study. 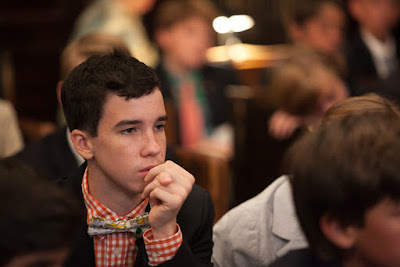 The model puts understanding up-front, placing an emphasis on selecting generative topics that will capture boys’ attention and provide opportunities for connection making. Units are framed with overarching understanding goals or throughlines. 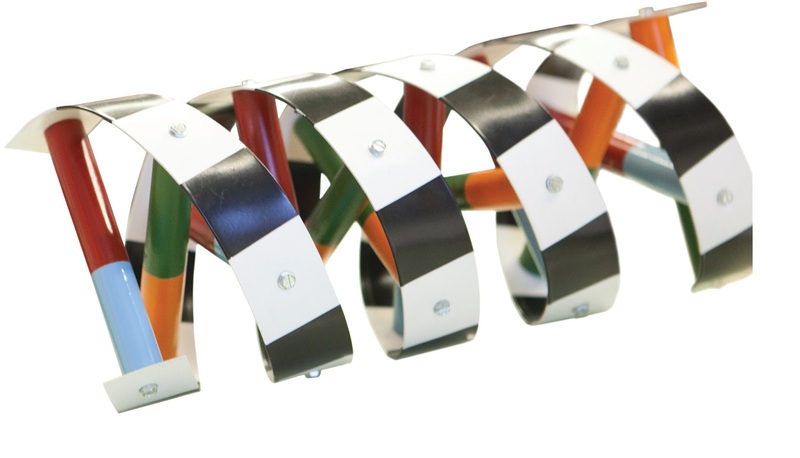 Throughout a unit, students engage in a series of performances of understanding that are intimately connected with the throughlines. Students and teachers track students’ progress toward understanding through ongoing assessments. The Teaching for Understanding Framework has provided us with a common language for talking about teaching and learning, and it has helped us “reversion” our program to include signature learning experiences that promote understanding. In their first session with an educator from the DNA Learning Center of Cold Spring Harbor, eighth graders participated in an observational lab about catalase, an enzyme found in many plants and animals that digests poisonous hydrogen peroxide into harmless water and oxygen molecules. 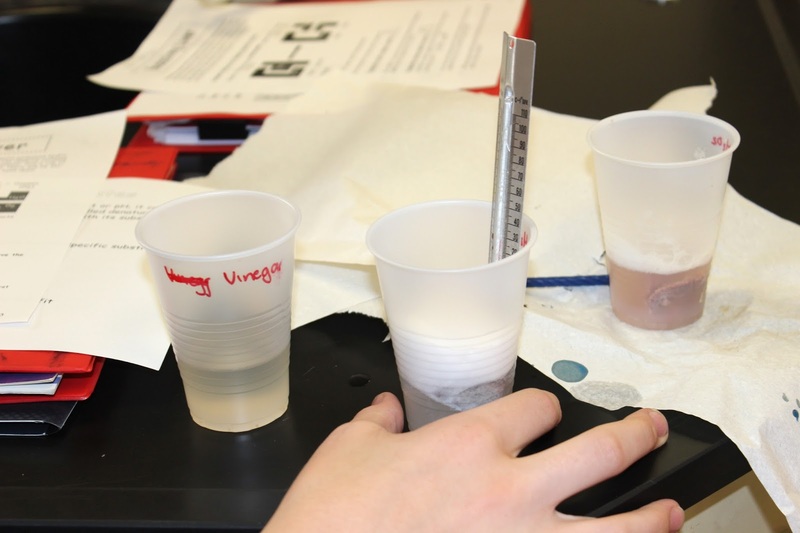 To test if the enzyme really does produce oxygen molecules, boys took a sample of calf's liver (which contains catalase) placed it into a cup of hydrogen peroxide, and observed the change in temperature and bubbling that occurred, noting that these indicated the possible release of oxygen. To further test, they took a small lit match and placed it in the bubbles, observing that the larger flames that resulted also indicated the presence of oxygen (see video clip). They then experimented and observed the deformation that occurred when the enzyme was heated or treated with acid (vinegar). In this lesson the boys saw the importance of having a control in their experiment, of being precise, and thinking critically and deeply to hypothesize results. This was the first of several sessions that the DNALC will conduct in collaboration with Saint David's teachers as the boys conduct a yearlong microscopic and macroscopic exploration of the science of the human body, which will culminate this spring in an original DNA research project. 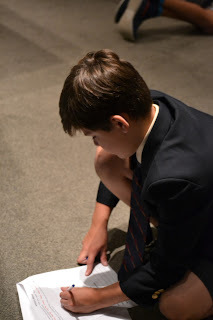 Saint David's partnership with the scientists from the DNALC in Grade 8, now in its second year, affords our boys an exciting opportunity to engage in hands-on investigations with DNA scientists. Sitting atop the highest peak in the foothills of the Blue Ridge Mountains, just outside Charlottesville, Virginia, I opened my summer; the season closed with me sitting cross-legged on the floor of a Buddhist Temple in the Hudson Highlands of New York. It was a summer of profound contrast, setting the stage for Saint David’s 65th year. Experiencing the architectural beauty of Monticello for the first time, one can’t help but admire the genius of Jefferson—a founding father of a nation and a university. One also can’t help being struck by the incredible paradox Jefferson’s Monticello represents. The very ideals of the Enlightenment that informed his authorship of a Declaration stand in stark contrast to the policies and practices of his day. Although he was trapped by the prevailing culture of his time, Jefferson could see what others could not—a different moral country ahead. In our Western (classical) tradition, introspection is valued. Etched in stone on Apollo’s Temple at Delphi are the words “know thyself,” and St. Augustine, in the school’s faith tradition, certainly wrote extensively about introspection; that’s largely where it has stayed—on walls and in books. Not widely practiced in today’s popular culture, introspection has given way to having needs and desires met now, on having the fastest, latest, and best immediately. If we want to teach our boys introspection, we have to reclaim the tradition. Eastern philosophies and religions have not lost this practice. Introspection, they tell us, begins with the mind, and like any skill it must be practiced. To know, shape, and liberate the mind, we first have to teach our boys to filter out the noise around them so that they may see what’s really there and develop mental qualities that weaken and undermine distractions. We then need to teach them to reflect inward to find that quiet voice within. When our boys learn to do this effectively, they can see more clearly what is truly important. None of this is easy; it takes sustained effort to strengthen the moral core. It’s our experience and what we repeatedly do, that leave a residue on our souls. (2) What we choose to do, especially that which becomes routine, shapes our inner moral core. I love the first day of school: greeting the boys as they return, the flurry of excitement, some nerves but mostly eager anticipation. After a long and spectacular summer, we are back and excited to get down to the business of teaching and learning. 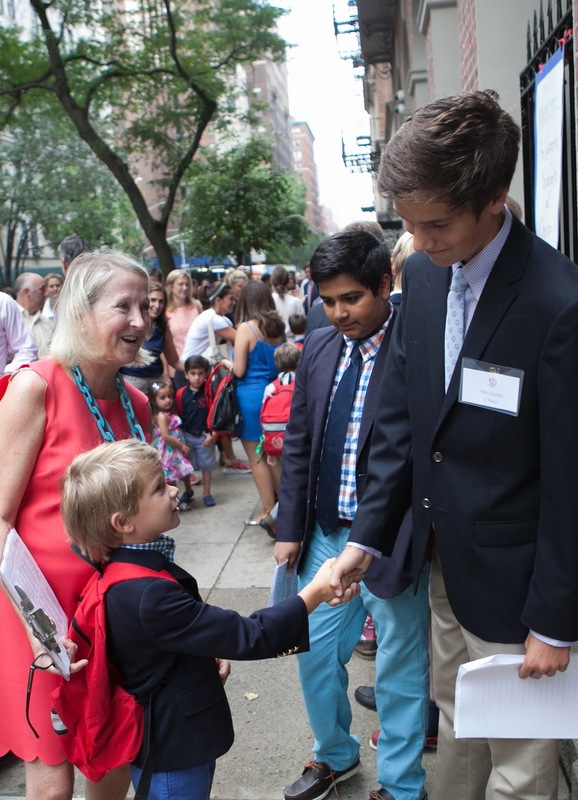 The spirit of Saint David's is epitomized by one of its most treasured first day of school traditions: our youngest boys being greeted and welcomed to their first day of school by our oldest boys. The smiles on little boys' faces when they take the hand of an older boy are priceless. 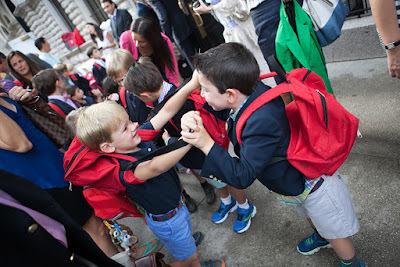 The bond between younger and older boy is one of many ways we create a culture of caring and connection.